The other day I was struck by an amusing scene in Mad Men, which prompted a part two to my previous blog post. It was the episode where Don gives his boy-faced brother-in-law William a terse life lesson about taking responsibility for William and Betty’s father. But before that scene something happens that captures the problem in a nutshell. Don comes home from work and sees William with the sleeves of his blazer rolled up to his elbows, trying to unclog the kitchen sink with a plunger. “Don, don’t worry about this. It’s under control!” Don characteristically says nothing, and leaves the room. Handyman (in)competency is densely symbolic and little else functions as economically to comment upon a character’s masculinity. I had the pleasure of teaching a course in genre and gender where we witnessed this trope turning up again and again. We screened the movie Unforgiven and read Janet Thumim’s seminal article “Maybe he’s tough but he sure ain’t no carpenter’: Masculinity and In/competence in Unforgiven. Her analysis of the film’s various displays of male incompetence, be it in carpentry, gun slinging, or pig farming, reveals how the Western genre and masculinity in general thrive upon public displays of skill and adequacy. This is doubly true in representation: the Western showdown is a show of masculine prowess by the two standing off, a scene for townsfolk peering out their windows as well as the viewers. Eastwood’s film is painstakingly reflexive so that audiences will glimpse some connection between those figures of light on screen and their own gender imitation. But what’s most compelling about Thumim’s article is the anomalous correspondence she points out between competence (which signals convincing masculinity) and morality (which marks maturity). This three-way relationship between masculinity, morality and handyman competence is closely but obscurely entangled. It’s precisely this non-clarity that gets exploited so cleverly in good drama. Unforgiven’s town Sheriff Little Bill Dagget (Gene Hackman) seems like an avuncular man with good intentions. He outlaws guns in his town; he tries to minimize bloodshed; he builds himself a house so he can smoke pipe and watch the sunset. The roof on his house leaks like a sieve, however. His poor carpentry skills—‘rough and ready’ as Thumim puts it—mirror his brand of justice: unequal, summary, and corner-cutting. A man who did a finer job cutting the wood shingles on his roof might have shown more sensitivity to the brutal mistreatment of the town’s prostitutes, but Bill’s sadistic, abusive, and borderline racist nature, foreshadowed by his shoddy carpentary work slowly reveals itself. Subsequently, he comes to his reward without ceremony, at the hands of a bounty hunter in the final scene. His dying words: “I don’t deserve this… to die like this. I was building a house” are rich. The house that would redeem him is a barely glimpsed synecdoche, as much for the audience as it is for Little Bill. Though he is as oblivious to his incompetent carpentry as he is to his miscarriage of justice, the relation between them can’t help but spring to mind in his final seconds. The devil’s in the details, as it were. The moral threads of a character can be read in their handiwork, and if the screw’s too loose or too tight, it will manifest as a tic in their masculinity. If Little Bill’s screw is too loose, then Breaking Bad’s Walter White’s screw is too tight. The two are comparable in many respects. Their compulsive masculinity has them both tinkering with the handyman synecdoche. And because Breaking Bad is primarily about masculinity, it strategically deploys the Western as its shorthand, both in its picturesque desert vistas and its penchant for showdowns. Take for example the OK Corral standoff toward the end of season five, an Easter-egg referenced on a painting in Hank’s living room. Or consider one of the first heated moments between Walt and his brother-in-law Hank. “My son, my bottle, my house!” Walt roars during his poolside party. Here, Walt’s had enough of Hank’s storytelling, showboating and making moves to become Walt Jr.’s preferred father-figure. If Walt wants to keep topping his 16 year old son’s cup with tequila, he’ll be damned if he’ll let Hank stop him in his own house. The guests fall silent as Walt and Hank glower at each other, both unwilling to budge, until Walt Jr. breaks the deadlock by throwing up in the pool. It’s no coincidence that this is the same episode when Walt decides to put on his coveralls and replace his water heater. The failing water tank had vexed the family since the pilot episode and stood as a reminder to Walt—along with the unkempt swimming pool, the part-time car-washing job, and the veggie bacon—of the countless little things that emasculate him daily. It’s interesting to note how very different Walt is from Little Bill in practicing his handyman competency. When installing the new water heater, Walt notices the floorboards beneath had rotted, so he returns again to the hardware store. As he neatly cuts out all the boards and replaces them, his son enquires what he’s doing. “We’ve got rot,” Walt replies, passing his son a softened plank of wood. “Do you see that?” Walt asks, almost proudly. “Those are fruiting bodies.” “Fruity wha?” says the son, perplexed, less by the term than all the changes that have transpired in his father’s embodiment. This is certainly not the Walt of earlier episodes: diffidently occupying a corner, furtive, tight-lipped and patronized by Hank. Being a man, for Walt, has become something he continually must prove. And this means excising all the ‘fruity bodies’ and shoring up the floorboards of his masculinity. Standing up to alpha Hank requires the same confidence as rebuilding his home: both are predicated in the righteous power of being competent. ‘Competent’ here means having knowledge of power tools, fruiting fungus, complex chemistry, and the exact number of BTUs presently heating up his family’s water. Competence is crucial to masculinity, and the way Little Bill and Walt each practice their handiwork reveals their moral grasp on things. Whereas Bill is slipshod and unperceptive, Walt sees everything and revels in the nitty-gritty with obsessive-compulsive zeal. This zeal is not a psychological debility, however; it’s a masculine affliction. The common characteristics of ‘violence, aggression, extreme competitiveness, [and] a gnawing insecurity… [which leads to] a masculinity that must always prove itself and that is always in doubt,’ is what sociologist Michael Kimmel defines as compulsive masculinity, and what Walter White demonstrates in all its ugly nuance and insidious reach. Both Little Bill and Walt are caught by the same affliction, but each displays its symtoms differently. Little Bill would like to end violence and live in peaceful repose, but cannot restrain his sadistic glee whenever given the opportunity to prove himself through force. Walt, on the other hand, is given ample opportunity to give up crime and return to being a tender spouse and father, but he will not. Or cannot. He takes too much pleasure in the show of his own competence. Masculinity means nothing without witnesses: it needs a feedback loop. Why else would it be so important for Walt to hear the sound of his own alias repeated back to him from his competitor? Say my name. The masculine subject needs to see itself being seen, by the right people and also in the right settings. Walt’s masculinity is on stage three times in this episode. Beginning with the pool, his gnawing interiority reveals its ugliness to Hank for the first time. Then later, in the house, Walt emerges from his DIY labor for a snack. Sporting his coveralls and respirator, he munches loudly at the kitchen table. His son and wife Skylar sit there watching him, nonplussed and unimpressed. 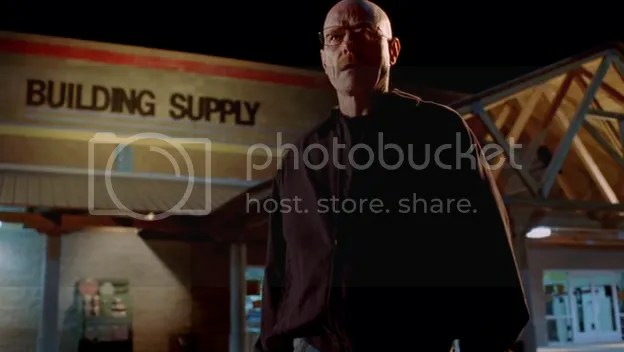 Walt appears insulated to her lack of affirmation; or perhaps that lack is just the response he’s looking for… And lastly in the closing scene outside the hardware store Walt warns a thug twice his size to keep off his territory. If the first act showed bad moral judgment and the second fell on deaf ears, then Walt hits his marks in the third. His compulsive masculinity has finally landed in the right milieu, where the strength of his self-righteousness can menace thugs and lowlifes. What is worth noting at the end of all this is how utterly self-engrossed exhibitions of handyman competence can be. It has nothing to do with the work itself, but what the work aims to fulfill. It’s not that the subject becomes an island to himself, but enters into league with other compulsive masculinities, who are rarely friends or family and almost never their female partner. Still, the divide sheers right through fabric of the family, making strangers of husband and wife, father and son. Any discussion of Skylar-hate or the polarized fandom regarding Walt’s morality can find the root of the problem elegantly dramatized in this episode. Walt’s compulsive masculinity as demonstrated through his DIY handiwork is unwelcome in the home. It severs him from his family and leaves him finally earning the fear and respect only of those he does not love. Such is the cost for men who strive to be extraordinary and are never at ease with their fruity bodies. Kimmel, Michael S. The History of Men: Essays in the History of American and British Masculinities. New York: SUNY Press, 2005. Print.